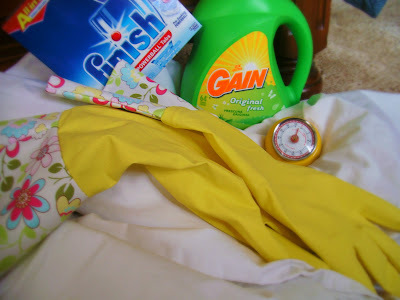 The other day my mom and I were chatting about cleaning, and she sent me to this post over at the Inspired Room. Something in this post really clicked with me - perhaps it is my aesthetic personality - but I am attracted to all things lovely. Including cleaning supplies. You should go read her post for yourself, but what it basically says is, make cleaning an enjoyable experience for yourself. She recommends lighting candles, making some coffee, using good smelling cleaning supplies, and listening to good music. Sounds like a plan to me. So here's what I did. My number 1 nemesis: LAUNDRY. then sits in the basket all neatly folded until one of us needs it. Strategy #2: "A load of laundry a day keeps the laundry blues away". To avoid the 6 days it takes me to usually take care of 1 load, I am now completing one load (washed, dried, folded, put away) every day of the work week. So far it's working pretty well (it's been 2 weeks now), and it's not that big of a deal to just do one load. Again, the product is key here. I am in love, I mean in love with Finish Powerball Tabs. It really cuts down on the rinsing time, and leaves dishes sparkling clean. I am also trying to run the dishwasher at least once a day. I use Flylady's timer method here. I set my kitchen timer for 10 minutes, and I can dust everything important in my house during that time. Only 10 minutes a week. I also like rewarding myself by lighting a candle on my newly dusted mantel! Yeah this one's no fun. No one likes to see money leaving their account to pay for things like medical bills and student loans. BUT it is a necessity. #1 thing that is helping me - this app on my smart phone(thanks mom and dad!) called Billski. It sends me an alarm 2 days before each bill is due, and it has a little icon sitting at the top of my screen until I pay it. It's really helping me. To actually pay them, I fix myself a cup of coffee, try to wait until Charlotte is asleep so that I can think, put on some Pandora (I'm loving the Hawaiian IZ Station), and get cozy on the couch. I also try to think of some reward - like looking at favorite blogs or something - for when I'm done. So there you have it - one step closer (or really four steps closer) to my New Year's motto of Balance. I want to hear from you - any tricks you have for conquering your least favorite household chores? and remember - the more comments you leave, the more chances you have for winning that lovely little apron! p.s. Let the record show that I actually completed all of these tasks before posting this. Just so you know I am for real :) OH and none of those companies pay me to say any of that - I'm just telling you like I would tell a friend.